Late this fall, Bob and I visited Algonquin Provincial Park, in Ontario, and with the early snowfall received in the area, the Park was totally transformed from even a couple of weeks before. As we made our way around the Park in search of wildlife, we could not resist the temptation to revisit the home range of a couple of Red Foxes (Vulpes vulpes) known to many people. 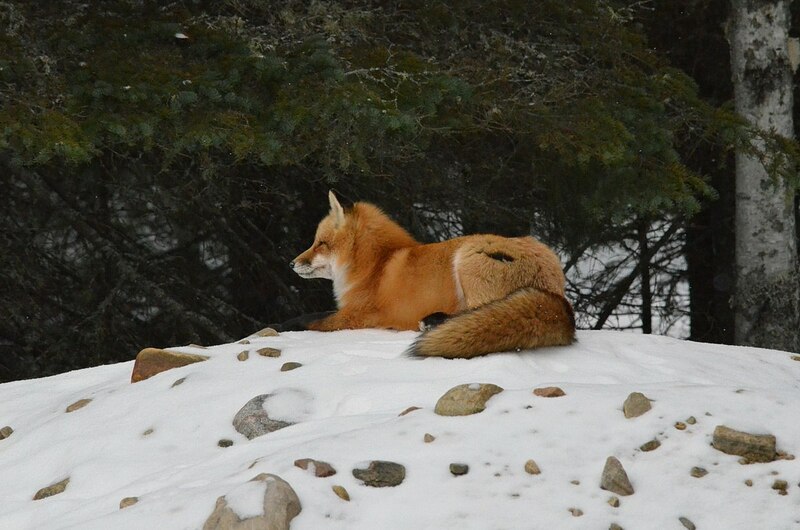 The resident Foxes were out and about and seemed all that much more beautiful given the white canvas that accentuated their rich red coat of winter fur. 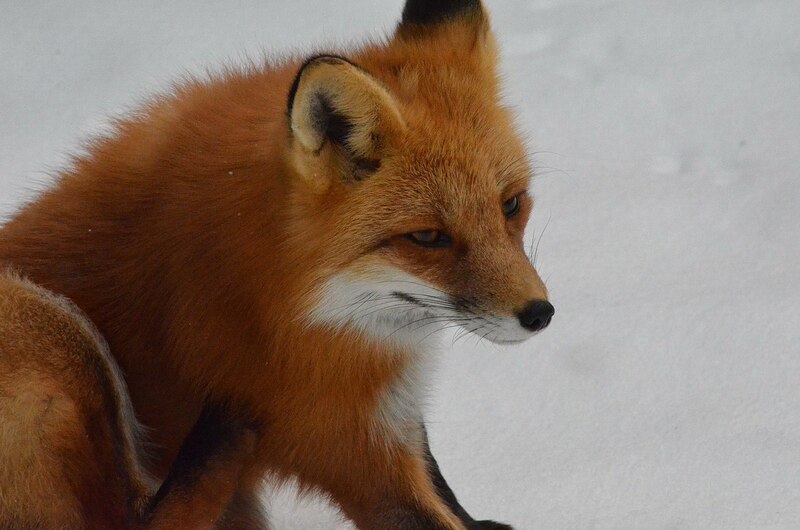 Red Foxes are nocturnal mammals, but if they are comfortable in their territory and do not feel threatened, they will change their habits and hunt during daylight hours. 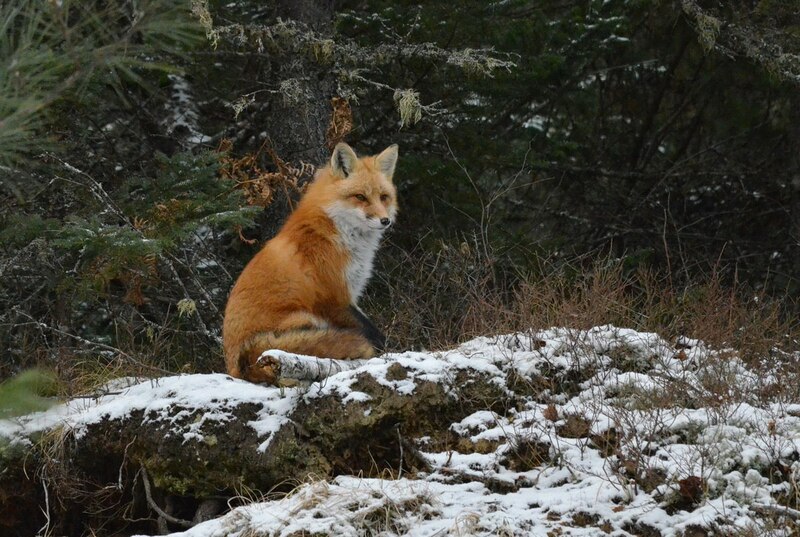 Set against the dark green boughs of nearby Spruce Trees, this Fox’s rusty red fur gleamed even in the dull sunlight. 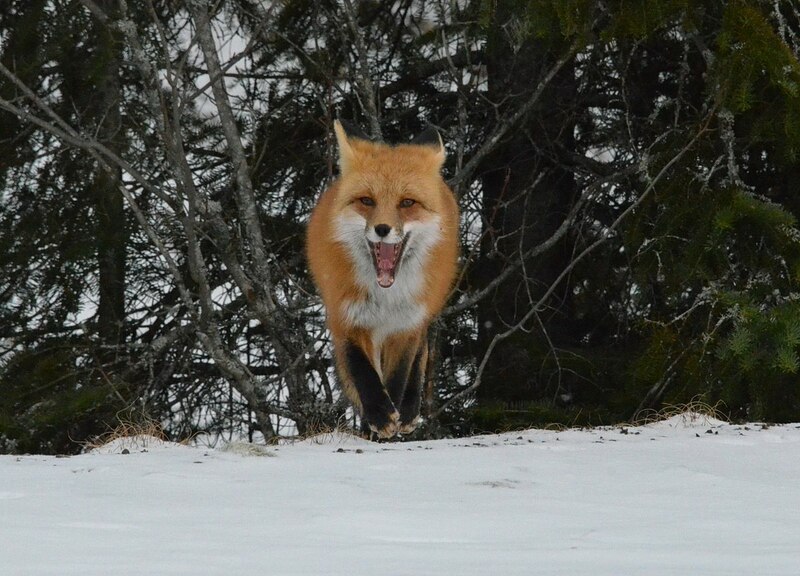 The male Red Fox seemed no more interested in Bob and me than in flying to the moon. Taking its ease, the Fox gave me a good opportunity to enjoy its luxurious coat of fur and delicate facial features. 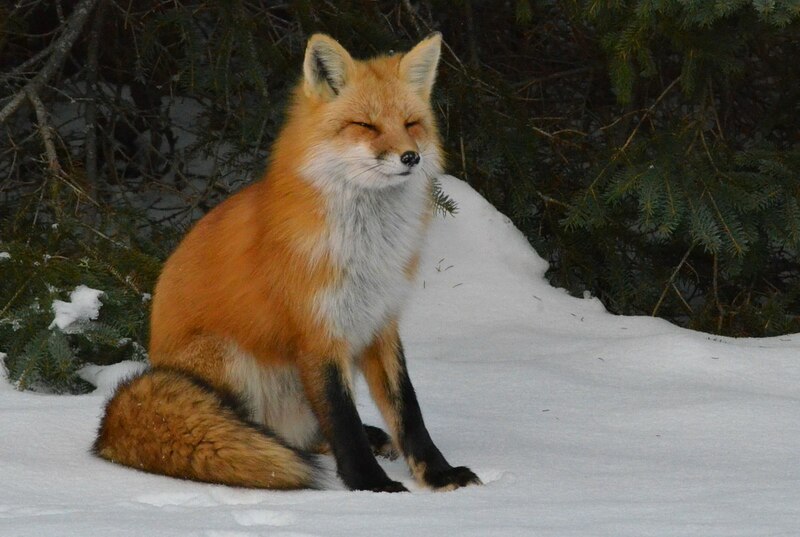 The fur of Foxes in the northern regions of their range is very long, dense, fluffy and soft. Although we think of Foxes living in dens or burrows, between autumn and March, Red Foxes are just as apt to bed down in thickets and dense bush even as the coldest winter weather embraces their region. 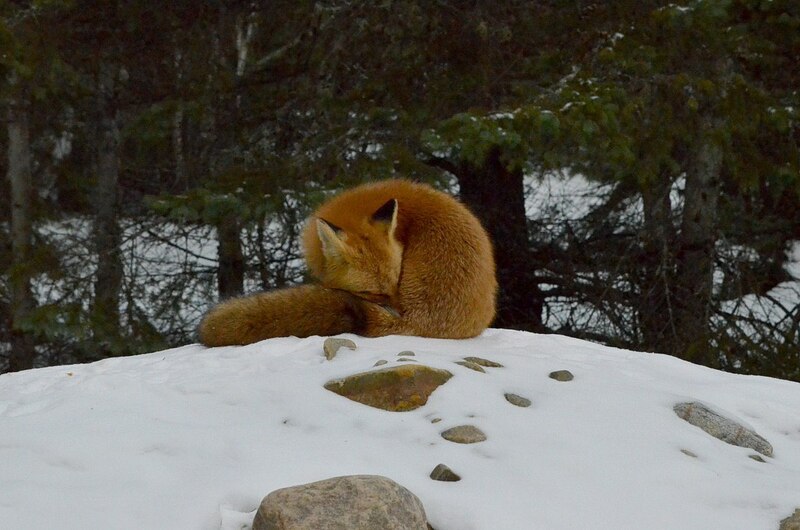 The thick tail, or brush, gives added warm cover when wrapped snugly around a fox’s body. 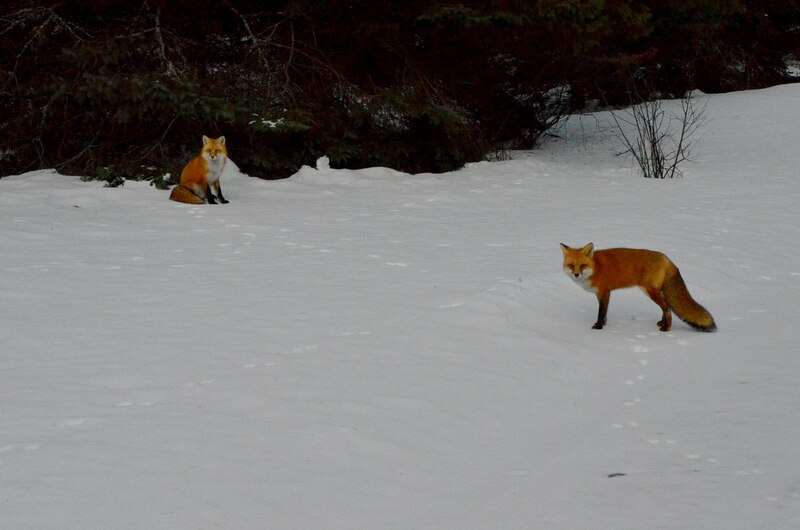 It was nice to see the pair of Foxes hanging out together because often only one of these two is spotted at a time. Red Foxes are monogamous, so a family group such as this pair shares a joint territory and that is why these two are often in close proximity to one another. On top of that, breeding season commences in winter with courting and mating occurring between late December and mid-March depending on their location within the broad geographic range of this species. Here in our northern climes, a pair will typically mate in February with the pups being born in late April or early May. When Bob and I first arrived in the general vicinity of the Red Foxes’ den, neither animal was seen, so we did some exploring further afield and were surprised to come across this individual, the female or vixen, hunting a good distance from the den. It is amazing how much land was covered in a very short length of time as the Fox scoured the surface of the snow in search of food. 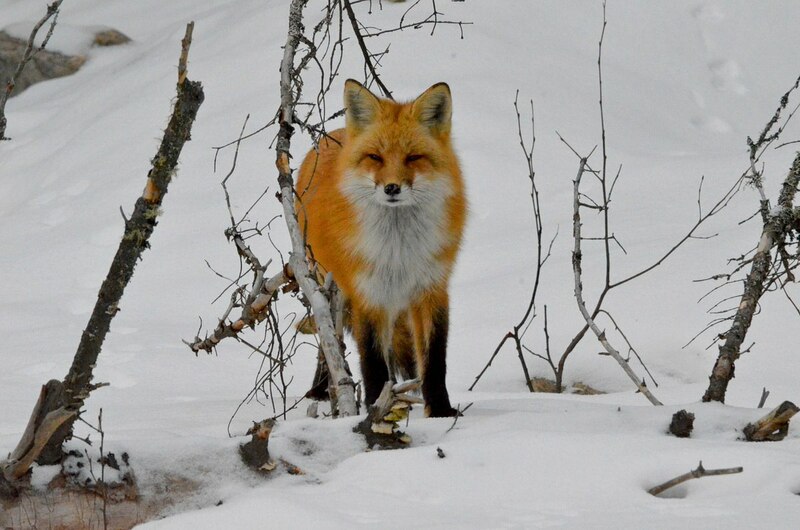 Even as we looked on, the Fox crisscrossed the forest trail countless times in its perpetual quest for something good to eat, back and forth, up and down embankments and beneath balsam trees where the branches dragged their needles on the frosty surface. 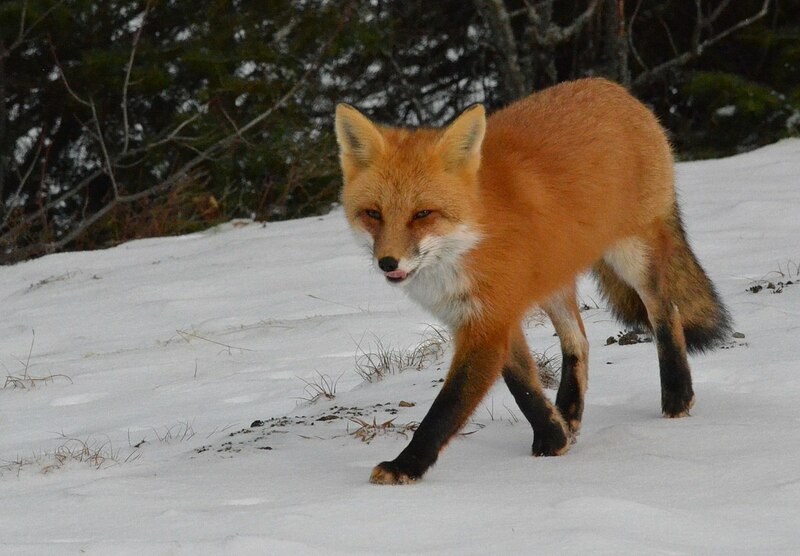 Near a wisp of crispy, dead grass, some small tidbit was hiding in the snow, and the vixen unearthed it for a snack. 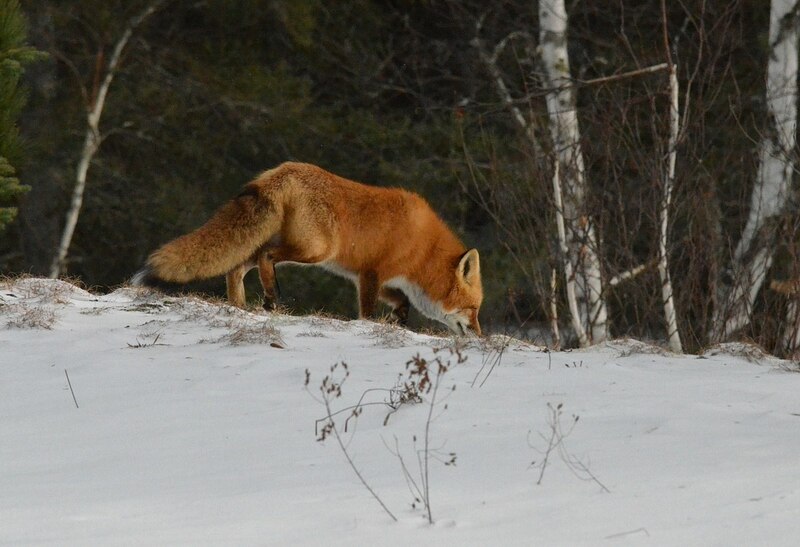 A few minutes later, in a thicket on the other side of the broad clearing, the Red Fox was in active pursuit of some creature hidden by the snow. We could see her ears rotating as she zeroed in on sounds that we could not hear, and the Fox actively traced the prey’s movements for a foot or two before giving up and heading off into the woods. We took our leave and returned for a second look back where we originally sought the Foxes, and there we found the male Fox or dog fast asleep on a ledge at the top of a steep bank. It wasn’t long before the female arrived on the scene, having come cross-country from her hunting expedition. That is when the male decided to come alive and see what his missus had been up to. but within minutes, she changed her mind and turned her attentions to grooming, using her teeth to pull out gobs of snow from between her toes and small pieces of debris stuck in her fur. The female spent considerable time cleaning her fur, which is typical Fox behaviour, and the attention left the red coat looking neat and tidy. 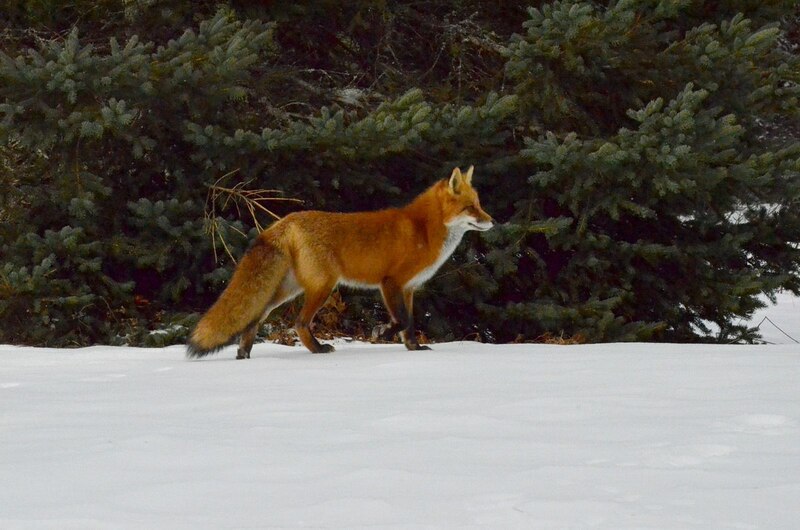 After watching the Red Foxes for about 30 minutes, Bob and I carried on in the hopes of other wildlife sightings. In addition to seeing three Wild Turkeys, we also stumbled upon a Cow Moose and her Calf. It had been a very successful outing.